Products From New Zealand.com is established as a premier Internet destination for things that are uniquely New Zealand. Unique handcrafted photo albums in native New Zealand timber. 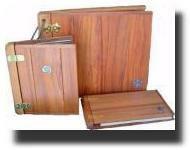 These superb photograph albums are made using native wood found only in New Zealand. There is a choice of the soft golden glow of Kauri timber, or the rich reddish-brown warmth of our native Rimu timber. These photograph albums are the perfect enduring gift to save treasured memories. Whether the occasion is an engagement, wedding, new baby, graduation, anniversary, birthday or any other special event. Pohutukawa - Wendy Leach Limited Edition Print. Maps of Walking Tracks in New Zealand - Driving Scenic New Zealand map - Art & Culture Book of NZ - Outdoor Adventure Travel Book - Relaxing New Zealand Birdlife Music CD - DVD of stunning New Zealand scenery - Scenic New Zealand Coffee Table Book - Maps of Walking Tracks in New Zealand - Stunning Landscape Calendars - New Zealand to English Translation Guide - Unique gift from New Zealand to get me in the mood!